Book your Walt Disney World 2018 holiday early to take advantage of the best offer of the year! Disney last week released their ever popular ‘free dining’ offer exclusive to UK residents and although they are only taking advanced bookings at the moment prior to the official launch on the 6 April… it’s certainly safe to say ‘FREE DINING IS BAAAAAACK’ !! The free dining option is only available for selected arrivals between 1 January – 18 March, 2018 and 6 April – 30 November, 2018 (and so not including Easter and Christmas) and must include a 5 night minimum stay at one Disney hotel inclusive of the purchase of a Disney Ultimate ticket for your whole party. If you are a follower of our vlogs over on youtube you will know we took our first onsite trip last year and took advantage of our first ever ‘free dining’ experience. Prior to our trip last year I will openly admit that I was always quite sceptical about the whole ‘free dining’ but i have to say having experienced it now for ourselves and its certainly something we will always look out for now. ….then the free dining offer is certainly something you should consider at least getting a quote for! If you haven’t already seen my blog post last year on how much we saved by staying onsite with the free dining then you can check it out here – we worked out that taking into account all the ‘added extras’ you get by staying onsite at Disney and the prices of the dining should you have paid for it that our accommodation actually cost us just £192 !! I plan to do some more number crunching so look out for some more of those style blog posts in the near future given this recent release of new prices. As always Walt Disney World have on offer this year their usual three main free dining plan options and are all dependant on the standard of Disney accommodation you choose. In addition to the above, like last year, they have included a free dining option to those who chose to stay at the cheaper (but more Disney themed) value resorts like we did last year in the form of a ‘free breakfast’. Now although it is promoted as a free breakfast you don’t have to use it at just breakfast. You get one quick service dining credit per person per day that can be used at ANY time. Disney haven’t put a time limit on it as yet and i can’t see how they would be able to to be honest so again although its promoted as a free breakfast you could buy a lunch or dinner with it in the parks with no issues whatsoever. This makes the ‘breakfast offer’ very valuable in my eyes as there are very limited places to get breakfast we felt and it isn’t actually that expensive to just pay for yourself whereby using one QSDP credit at lunch for example you can grab yourself a 2 course ‘meal’ in the form of a hotdog or burger and a dessert + drink whilst in the parks. These kind of meals, from experience, tend to be from a minimum of $20pp so it’s certainly wise to NOT use it for what its promoted for at all and wait until lunch or dinner to get the most food for bucks! The table below shows what you get per dining plan – taking note that under 3’s can eat off your plate and do NOT need a park ticket these ‘per person’ credits are for those aged 3 and up. 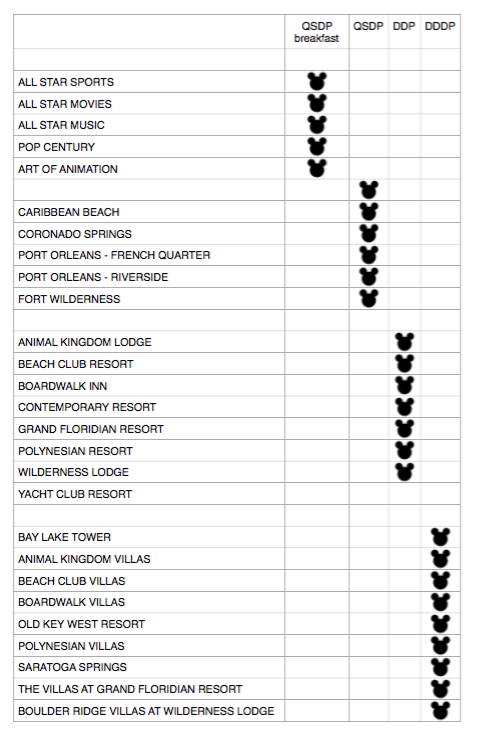 Again, each ‘free’ plan is dependant on the standard of Disney hotel you choose from value All Star resorts to deluxe villa resorts: the following table shows the resorts currently eligible for each free dining. All plans are available at each resort though and it’s here we are finding some good savings for example to upgrade to DDP at a value resort will save us nearly £600 in comparison to jumping up to the next graded resort to get closer to the DDP bracket – don’t feel like you HAVE to get an higher standard of accommodation to get a higher value dining plan as you don’t – upgrades are available and is something i think we will probably end up doing given we have small children who are still very much in the ‘wow’ faze; they thoroughly enjoyed the larger than life (literally!) value resorts last year. One thing to note though is all bookings made at Moderate resorts or above also get a free $200 gift card so thats just something else to bear in mind when you are playing with figures; it has been suggested to me in the last few days that this is great way to pay for any tips! Now although we weren’t on the higher dining plans last year heres some of the food we did end up buying and paying cash for in table service restaurants. I think its safe to say ALL of these are 100% on our ‘go back to’ list with or without the dining plan and so are one of the main reasons we are seriously considering upgrading to the DDP. Upon check in you will be given some magic bands – these are wristbands automatically linked to your reservation. You will also be given a piece of paper with the total amount of credit you have for the whole of your stay so although they are calculated as per day credits you can (if you really want to!) use all of them in the first day (not recommended obviously!) but they don’t limit you to using just one QSDP credit per day for example. You can use as many or as less as you want – if you want to save them then save them its entirely fine. 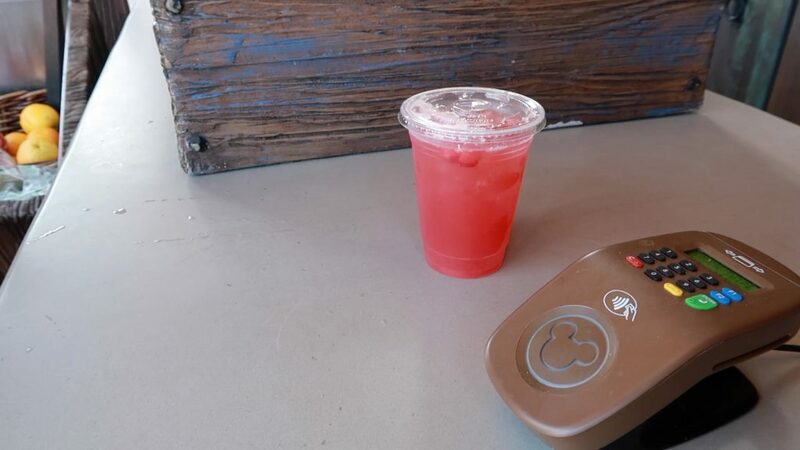 It’s the magic bands that you wave at the till or present to your server upon paying for your food – once you have paid your receipt will then have the number of credits you have remaining so it’s very easy to keep track of what food options you have left. free memory maker – leave it to Disney photo pass cast members to make sure YOU are actually IN family pictures than always behind the camera and download your pictures for FREE. exclusive fast pass & dining reservation booking windows – by staying onsite makes you eligible to prebook your fast passes 30 days before those staying offsite and also allows you to book up your whole stay as far as dining reservations are concerned whereby offsite guests can only book 180 days prior to each day of their vacation. I would LOVE to know if you have already booked or plan to book your next Walt Disney World holiday whilst this free dining offer is on? When and where are you going/staying? Next Post Our top 10 tips to get the most from your FREE Disney dining plan!